Sorry I haven't had a lot of time to create this week, as we had a long weekend away at Brisbane where my eldest boy competed in the State Championships for Discus and on Monday he had further testing for the Navy so we thought staying down there made more sense than driving back and forward for the three days, then Tuesday was that day when you come home from being away for awhile and within a matter of minutes the wash basket goes from empty to bursting at the seams (I can tell all you mothers out there are nodding your heads right now lol) And to top off a busy week it was my turn for Tuckshop duty on Wednesday. Now I am on a bit of a mission at the moment to use up some old supplies so I pulled out the Brocade blue ribbon I had left and worked the colours from it, going with Crumb Cake and Cajun Craze. 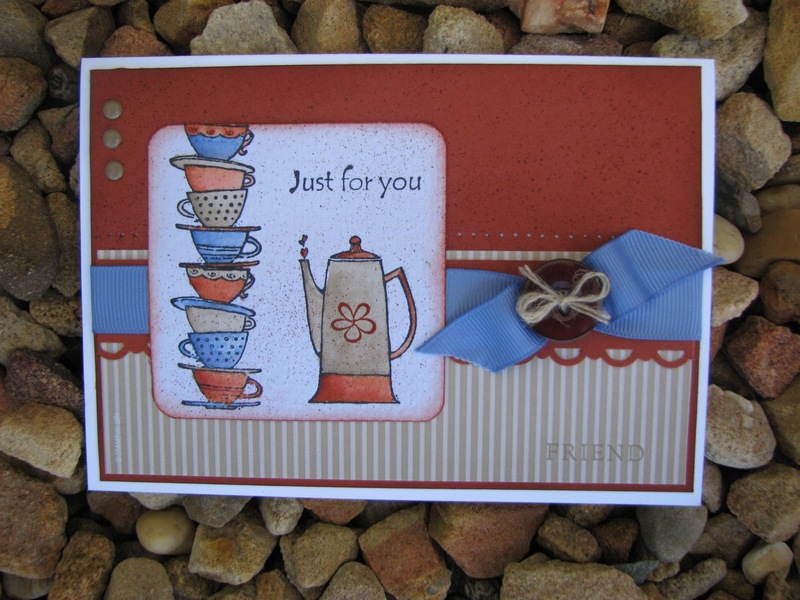 This is the first time I have used my Morning Cup stamp set and liked what I have made. I hope you like it to? I may just have enough time to fit in one more challenge today if I make it snappy before going to pick up the kids for swimming lesson, will be back tomorrow to show you. I love this card Tammy. This is a set I have been wanting to buy. Oh Tammy!! This is just the sweetest!! Don't know about you but I just CANNOT go without my morning cuppa.!! !....seriously addicted Lol!! WOW - as you know I'm not a lover of this stamp set, but you've made it look great. 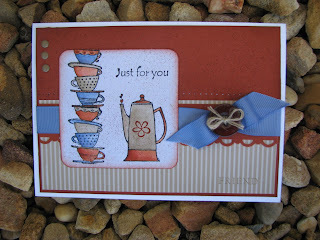 Very nice card, and the whole "CUPPA" thing is close to our hearts isn't it lol. Another great submission for the challenge Tammy!! You won't believe this but I was going to use this same stamp for my sample -- I think it is just the cutest stamp set. Thanks again for coming back! It's gorgeous! Love the colours, love the spritzing, love the brads .... and I'm trying VERY hard to convince myself I don't need that fabulous stamp set. You're not helping!!! Another well done card Tammy! One of my favorite sets. Thanks for joining us again!!!! I love that stamp set and I LOVE THE CARD. Thanks for playing along at Try Stampin'. 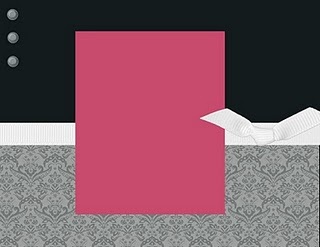 Wow love your card! This is one of my favorite sets, I need to ink it up more! Thanks for playing along again;-)! Wow, Tammy, you have been super busy!! This is a gorgeous card and that stamp set is cute. I love the colours you have chosen, very lovely together. Love this card!! Great colors, too. I just ordered this set - been putting it off too long :)Thanks for some inspiration for when it arrives. Congrats Tammy! Knew it was a winner! I will try to play this week!